Every productive person has a system for getting things done. You can’t be productive unless you have a system, a method, a process, whatever you want to call it. Basically, you have a way of doing things. Some people invent a system. Some people learn a system. But everyone has a system. In this article, I’ve laid out some of the most popular and effective productivity systems so you can get your productivity groove on. Getting Things Done is the brainchild of David Allen, as explained in his book, Getting Things Done. The Getting Things Done process begins with a massive brain dump to clear the mind of all the conceivable tasks in your life. Once the tasks are all put on paper, you can begin getting them done. Once all your tasks are outlined and organized into one of these 6 categories, you can begin knocking them out. Things that take a long time, such as a major project, should be broken down into a series of smaller, quicker projects. Getting Things Done has the advantage of putting you in control of your entire life. The startup time that’s required may be hard for some people, and implementation can be complicated. A productivity guru named Francesco Cirillo invented the Pomorodo Technique, a productivity system built on the idea of getting things done in predetermined blocks of time. Implementing Pomodoro is very simple. You break a task up into 25-minute segments, called Pomodoros. In between each Pomodoro, you take a 5-minute break. After 4 Pomodoros, you take a longer break. There are 6 objectives in organizing your schedule Pomodoro-style. Protect your Pomodoro from any and all interruptions. Estimate the Pomodoros needed for an activity. Create a timetable that matches your workflow and life. Focus on your personal objectives. 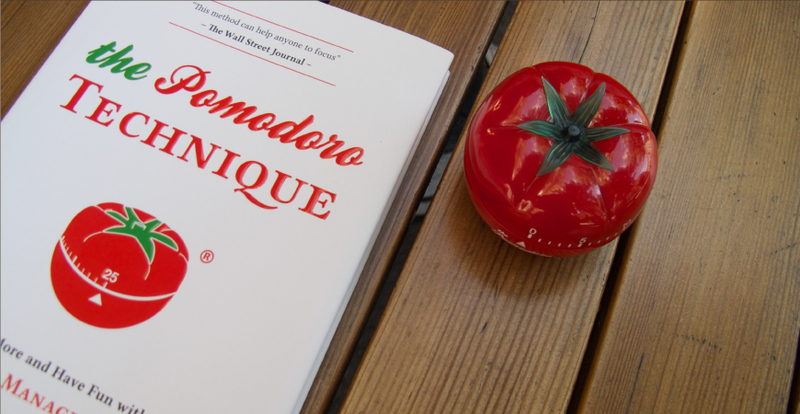 The ideas of Pomodoro are explained in the book The Pomodoro Technique. Work with time, not against it. Create a better work-life balance. Pomodoro works well for micromanaging your workday, but it limits flexibility and interactivity. Some people find it too structured, preventing them from coping with the shifting demands of a high-pressure, multitasking job. 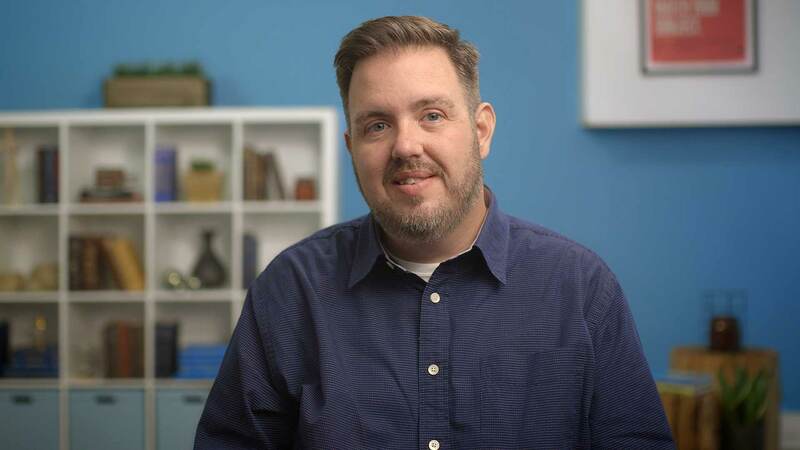 Sign up for our free video course, and learn how to lead projects and teams with ease so you can take your career to the next level! Zen to Done piggybacks on Getting Things Done, but reverses some of its alleged shortcomings. Zen to Done focuses on habits, where Getting Things Done focuses on the system. Zen to Done focuses more on actually doing the tasks, whereas Getting Things Done seems to focus on creating a system and hoping the system will produce higher levels of productivity. Zen to Done focuses on structuring a day around 3 MITs (Most Important Tasks) and the week around several Big Rocks (major projects), in contrast to the unstructured nature of Getting Things Done. Zen to Done focuses on simplification, allowing you to focus on the essentials (rather than trying to do everything). 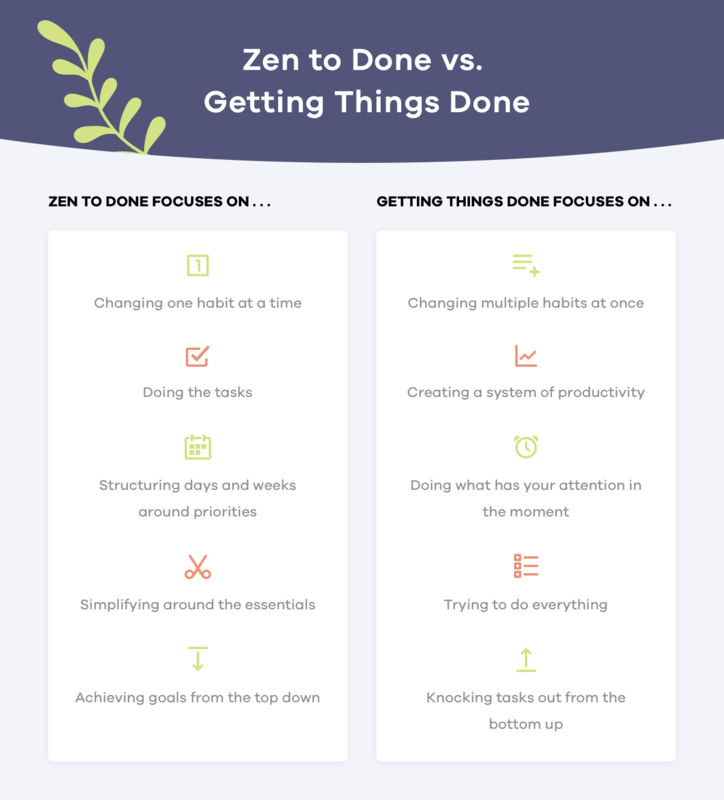 Zen to Done focuses on goal achievement (top-down), whereas Getting Things Done is a bottom-up approach, doing whatever little things come at you. Capture ideas, tasks, and notes in a notebook so you don’t forget them. Make quick decisions on things in your inbox; do not put them off. Set MITs for each day. Do one task at a time, without distractions. Keep simple lists; check them daily. Have a place for everything. Review your system and goals weekly. Reduce your goals and tasks to essentials. Seek work for which you’re passionate. Zen to Done doesn’t work for every type of workflow management. Some find that it does not have a structured approach to managing time because of its focus on tasks. This system, inspired by Jerry Seinfeld, focuses on creative success. It has helped people in creative occupations become more systematic and disciplined in accomplishing their tasks. Here’s how Don’t Break the Chain got started. Seinfeld started off the new year with a big calendar. He made a big, fat, red X over each day in which he successfully accomplished his goal of writing new material. Decide what you want to accomplish each day. Mark an X over each day you accomplish your goal. Figure out your goals. Three is a good starting point. Define the daily minimums for each goal. For example: Do 3 pushups, clean office for 5 minutes. Create a plan for lapses. You’re going to miss your goal sometimes, so allow your chain to accommodate occasional breaks. For example, allow yourself to put an X in a different color if you’re sick or on vacation, or allow yourself 3 floating “skips” each month. Put your calendar in a prominent place on your wall. Use a huge red marker, and put an X over each day you’re successful. Don’t Break the Chain can help you with your procrastination. It’s basically a hack to build consistency, form habits, and gradually achieve your goals. Don’t Break the Chain is very simple. You can start right now. Because of its simplicity, it doesn’t exactly work for organizing an entire day or managing your hours. 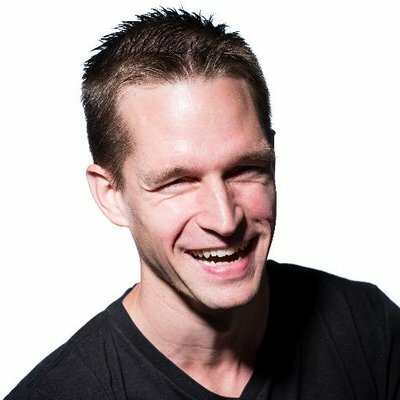 How to choose a productivity system. Once you start dabbling in productivity, you start to realize something very unsettling: All this productivity stuff about streamlining and simplifying is actually very complicated. There are so many options! So many approaches! Aagh! It’s easy to freak out and go back to wallowing in your unproductive mire. Just pick a method. All of these systems are designed to do one thing: get stuff done. So, just pick one. Make a decision in the next 60 seconds. Try it. Once you try a system for at least 30 days, you’re free to stick with it or try something different. Make your own. Once you settle into your system, you need to customize it. Your situation is different from David Allen, Leo Babauta, and Jerry Seinfeld. You have unique needs for your specific situation. Creating a productivity system can be overwhelming at first, but the ultimate goal is streamlined simplicity like you’ve been dreaming of. Yes, there’s a learning curve, but you’re paving a road for a beautiful simplicity. Watch the video below to see how TeamGantt works, and try our free online project management software today! Work remotely? It can be tough to work from home and get stuff done. Here’s how to create a home office that’s primed for productivity in 6 easy steps. Discover a simple 5-step process that can help you use the end of your workday to deliver awesome productivity to your entire work existence. Are the Best Managers Introverts, Extroverts, or Somewhere In-between? Does personality type affect your ability to manage a team? Compare introverted vs. extroverted leadership styles so you can lead from your personal strengths.